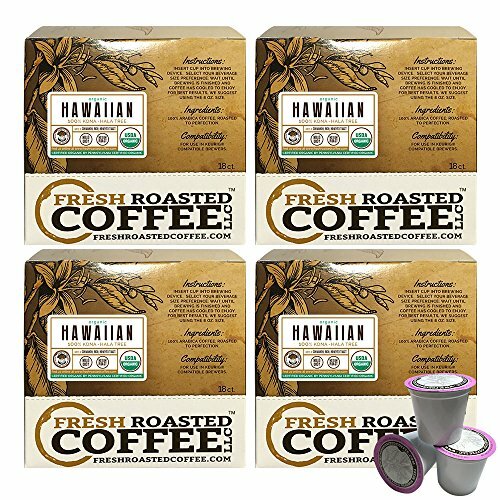 Organic 100% Hawaiian Kona Coffee Cups, Direct Trade - Hala Tree Farms, 72 ct. of Single Serve Capsules for Keurig K-Cup Brewers, Fresh Roasted Coffee LLC. USDA Organic, Direct Trade 100% Hawaii Kona Coffee from Hala Tree Farms. 72 count of single serve capsules for Keurig K-Cup brewers. No harsh chemicals or pesticides used. Fresh Roasted Coffee LLC. and its products including its FRC Cup products are neither affiliated with, nor approved by, Keurig®, Incorporated. "Keurig®" and "K-cup® " are registered trademarks of Keurig, Incorporated®. If you have any questions about this product by Fresh Roasted Coffee, contact us by completing and submitting the form below. If you are looking for a specif part number, please include it with your message.